Trying to find your way when the mist comes down, or it is getting dark can be frightening. Planning to walk in the dark is great fun if you have the skills to navigate safely. 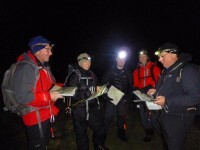 This 3 hour evening night navigation course is designed for people who have basic map and compass navigation skills, and want to learn more advanced techniques and stay safe when walking in poor visibility.